Kamo Bayi put the home team ahead in the 21st minute, but Chennai cancelled out the advantage through French forward Jean-Michael Joachim six minutes later. 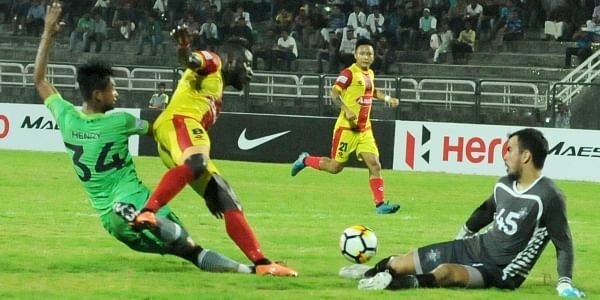 KOZHIKODE: Football fans in Kozhikode were treated to 90 minutes of eventful action as Gokulam Kerala FC and Chennai City FC played out a 1-1 draw at the EMS Corporation Stadium, in what was I-League’s return to Kerala after almost five years. Kamo Bayi put the home team ahead in the 21st minute, but Chennai cancelled out the advantage through French forward Jean-Michael Joachim six minutes later. Gokulam went in search of a winner in the second period but were forced to settle for a point. With influential centre-back Emmanuel Chigoize out injured, left-back Provat Lakra moved to the centre of the defence with Santu Singh making his I-League debut for Gokulam on the wing. Former Mumbai FC attacker Rohit Mirza, Cameroonian medio Francis Ambane and Vicky Meitei all made first starts for the home side. For Chennai, seasoned campaigners Pradeep Mohanraj and Dharmaraj Ravanan dropped out of the XI that went down 3-0 to Indian Arrows in the first match, while there were also starts for youngsters Sebastian Thangmuansang and Alexander Romario Jesuraj in place of Gaurav Bora and Nigerian defender Lucky Kelechukwa Micheal. In front of a crowd of 25,841 for their first home game, Gokulam had the first effort on goal. Vicky, playing on the left wing, fired the ball past Chennai’s Slovenian goalkeeper Uros Poljanec but not defender Henry Monsang, who blocked it on the line. In the 21st minute, Sushanth got a delightful pass to Kamo from the defence, but the former Aizawl FC forward still had a lot of work to do. He brought the ball under control with his first touch, battled Henry Monsang to make it to the box and rounded the goalkeeper before rolling the ball into the net for Gokulam’s first goal in the I-League. Chennai responded positively to adversity. Their French import Joachim was a constant threat and ballooned over a cross from Edwin Sydney Vanspaul in the very next minute. Five minutes later, it needed a double save from Gokulam custodian Nikhil Bernard, who kept out efforts from Soosai Raj and Joachim. It wasn’t long before the visitors found the equaliser. Joachim and Vanspaul combined again in the 27th minute. This time, the French forward headed in at the far post from Vanspaul’s corner.